Taksim Square. The spark for the protests was a government plan to turn a park into a replica Ottoman-era army barracks and mall. ISTANBUL — Violent protests against the government of Prime Minister Recep Tayyip Erdogan engulfed Istanbul, Turkey’s largest city, on Saturday and spread to other cities, including the capital, Ankara, as tens of thousands of demonstrators took to the streets in a second day of civil unrest and faced the tear gas and water cannons of a harsh police crackdown. 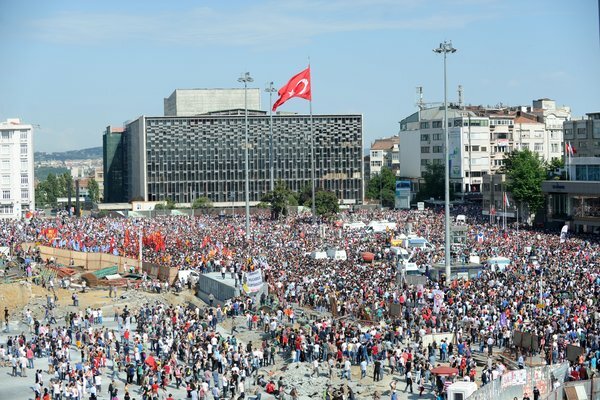 By late afternoon, the police withdrew from Istanbul’s central Taksim Square, allowing the demonstrators to gather unimpeded in the place that set off the protests last week with government plans to turn a park into a replica Ottoman-era army barracks and mall. The departure of the police, who had been widely criticized for violent tactics on Friday, set off scenes of jubilation and destruction, as some drank and partied while others destroyed police vehicles and bulldozers. While the protest began over plans to destroy a park, for many demonstrators it had moved beyond that to become a broad rebuke to the 10-year leadership of Mr. Erdogan and his government, which they say has adopted authoritarian tactics. Some saw the police pullback as a historic victory. Still, it was far from clear on Saturday whether they could capitalize on that success. The Islamist-rooted government retains wide support among religious conservatives, and Mr. Erdogan insisted Saturday that the redevelopment of the square would continue as planned. By nightfall, as the crowds in Taksim Square grew rowdier, a sense of foreboding crept in as many worried that the police would return. In the Besiktas neighborhood, the police were still firing tear gas, and protesters were erecting barricades in the streets. The Interior Ministry said it had arrested 939 people at demonstrations across the country, and that 79 people were wounded, a number that was probably low. After Friday’s protests, which were smaller and less violent than those on Saturday, a Turkish doctors’ group reported nearly 1,000 injuries. The scenes carried the symbolic weight of specific grievances: people held beers in the air, a rebuke to the recently passed law banning alcohol in public spaces; young men smashed the windshields of the bulldozers that had begun razing Taksim Square; and a red flag bearing the face of modern Turkey’s secular founder, Mustafa Kemal Ataturk, was draped over a destroyed police vehicle. But despite the comparisons made in some quarters with the street chaos of Egypt’s revolution, no viable political opposition here seems capable of seizing the disenchantment of secular-minded Turks and molding it in to a cohesive movement. The government, in its response to the crisis, sent mixed messages. Mr. Erdogan, in a televised speech on Saturday morning, vowed to go forward with the plan to remake the park in Taksim Square, while other members of his Justice and Development Party, including a deputy prime minister and the mayor of Istanbul, promised to listen to the concerns of citizens. The widening chaos here and the images it produced threaten to tarnish Turkey’s image, which Mr. Erdogan has carefully cultivated, as a regional power broker with the ability to shape the outcome of the Arab Spring revolutions by presenting itself as a model for the melding of Islam and democracy. Now Turkey is facing its own civil unrest, and the protesters presented a long list of grievances against Mr. Erdogan, including opposition to his policy of supporting Syria’s rebels against the government of President Bashar al-Assad, his crackdown on dissent and intimidation of the news media, and unchecked development in Istanbul. Many of the protesters, some of whom voted for Mr. Erdogan, said his leadership had become increasingly dictatorial. In a Twitter message late Saturday, Mr. Erdogan appeared to mock the protesters, saying he could mobilize a million people to support him in Taksim Square, while putting the number of protesters at 100,000. “When he first came to power, he was a good persuader and a good speaker,” said Serder Cilik, 32, who was sitting at a tea shop watching the chaos unfold. Mr. Cilik said he had voted for Mr. Erdogan but would never do so again. As they winced and rubbed their eyes of tear gas, protesters wagged their middle fingers at the police helicopters and chanted that the government should step down. On streets running off Istiklal, young men tore granite slabs from the sidewalk and bashed them against the road, picking up the broken pieces to throw at the police. On some streets, protesters set up makeshift barricades with trash cans, panels of wallboard from construction sites and potted plants taken from outside fancy hotels. Many of the protesters complained about the lack of coverage on Turkish television. Some newspapers too were largely silent on the protests: on Saturday morning, the lead article in Sabah, a major pro-government newspaper, was about Mr. Erdogan’s promoting a campaign against smoking. Ceylan Yeginsu and Sebnem Arsu contributed reporting.